The Saudi Arabian government on Tuesday reportedly sent $100 million to the Trump administration toward its support of the Syrian affiliate of the PKK terrorist organization, the People's Protection Units (YPG) – the same day that Secretary of State Mike Pompeo landed in Riyadh – timing that some are calling too good to be true. The New York Times said the funds were allegedly committed by the Saudi government in August "for American efforts to stabilize areas in Syria liberated from Daesh" – which are currently under the control of the YPG – but many bureaucrats in the U.S. have called the timing of the transfer "no coincidence." The promised money was put into U.S. accounts the same day that Pompeo arrived in Saudi Arabia for meetings with the Saudi king and crown prince over the ongoing investigation of prominent journalist Jamal Khashoggi – an issue that has heightened tensions between the longtime allies. President Donald Trump on Saturday said Saudi Arabia could be behind the disappearance of missing journalist Jamal Khashoggi and warned Washington would inflict "severe punishment" if he was murdered. However, he apparently recanted after a phone call with Saudi King Salman on Monday, suggested he believed the kingdom's denial of having "any knowledge" about Khashoggi. According to The New York Times, the funds in question may help limit the damage the Trump administration could inflict upon the kingdom over the Khashoggi case. Brett McGurk, the United States envoy to the coalition fighting against Daesh terror group, has denied any allegations that Pompeo's visit and the transfer of funds were connected. "The specific transfer of funds has been long in process and has nothing to do with other events of the secretary's visit," McGurk was quoted by the Times as saying. However, another U.S. official involved in policy on Syria said that the transfer of payments was unpredictable and no specific date had been set. The delivery of $100 million is considered as the latest move by Saudi Arabia in support of the partnership between the U.S. and YPG. Using the fight against Daesh as a pretext, the U.S. has been cooperating with the YPG in Syria and providing arms support to the group. After Daesh was cleared from the region with the help of the U.S., the YPG tightened its grip on Syrian soil taking advantage of the power vacuum in the war-torn country. Also, the terror group established the so-called "nine committees," which are similar to ministries. The YPG also formed a political entity called the General Council of Self-Administration last month in northern and eastern Syria, hinting to their autonomous plans. 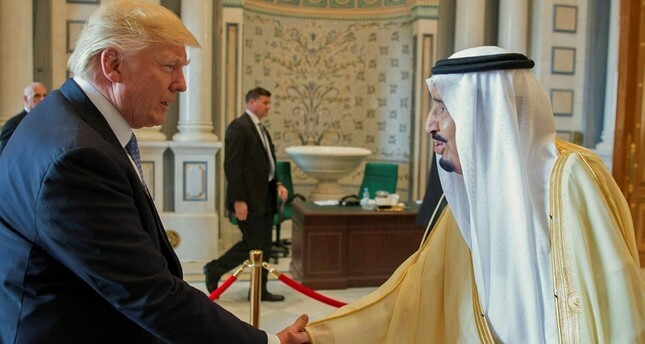 The money received from Saudi Arabia, as well as $50 million given by the United Arab Emirates, will allow for the Trump administration programs in Syria to continue without cutting further into the U.S. budget. Turkey has been voicing strong opposition to the YPG-U.S. partnership on the grounds that arming a terror group would eventually create serious security threats to Turkey. Ankara has been calling on the U.S. to end its cooperation with the YPG and eliminate terror groups from Syria to enable the return of refugees to their countries. In relation to the financial support from Saudi Arabia, Foreign Minister Mevlüt Çavuşoğlu yesterday said that it is no secret that Saudi Arabia had stated they want the U.S. to stay in Syria while the latter wanted to retreat and there are some common objectives or interests between these countries. "We cannot say for sure whether [the intention] is to support YPG or to balance the presence of Iran," he said. The steps taken by Saudi Arabia in Syria have been raising eyebrows in Ankara. Last year, Saudi Arabia delivered another $100 million to Syria's northeastern Raqqa province, which was captured by the YPG following the retreat of Daesh in 2017. In October 2017, Saudi State Minister Samir es-Sebhan paid a visit to some villages in Raqqa which had been captured by the YPG. Following the visit, Riyadh provided financial support for the reconstruction of Raqqa which was heavily destroyed during the fight against Daesh. Raqqa, the former stronghold of Daesh, was captured by the YPG with the help of airstrikes by the United States. However, the governorate has recently been shaken by public unrest in the face of the YPG's repressive treatment of the public. The YPG has frequently imposed curfews, raided local homes, arbitrarily arrested civilians and prevented locals from leaving the governorate since it took control of the city. Furthermore, last year the Saudi Okaz newspaper, known for its anti-Turkey stance and as Crown Prince Mohammed Bin Salman's mouthpiece, previously published controversial articles about the PKK in which they interviewed a senior figure from the PKK terror organization and termed him the group's so-called minister of foreign affairs.